At Blackstone Valley Prep, we know that standardized tests align strongly with college and career success. We also know our scholars are much more than a test score. Because we are committed to preparing every scholar for success in college and the world beyond, we spend a great deal of time examining and analyzing assessment results. We use them to help us determine what each learner needs next in his or her education. More broadly, results allow us to take a closer look at our practices, shine a light on what is working, and determine what changes need to be made to improve our model and better serve our scholars. These figures are only a part of what we do to prepare a child for what lies ahead. In addition to academics, we pay careful attention to both the social & emotional and cognitive & non-cognitive growth of every scholar. So while we are proud of our academic data, we are equally proud of the overall and continuous growth of our scholars. SAT results are in, and they are incredible! We are pleased to report that BVP scholars outperformed their peers in the state of Rhode Island on the SAT. BVP averaged 527 on SAT Math, compared to the state average of 475 and a weighted average from BVP’s sending districts of 435. BVP averaged 520 on English Language Arts (ELA), compared to the state average of 487 and a weighted average from BVP’s sending districts of 447. Indeed, BVPHS’s overall academic achievement is extraordinary, with SAT results that are in the top 10 percent in the entire state in math and top 20 percent in ELA. 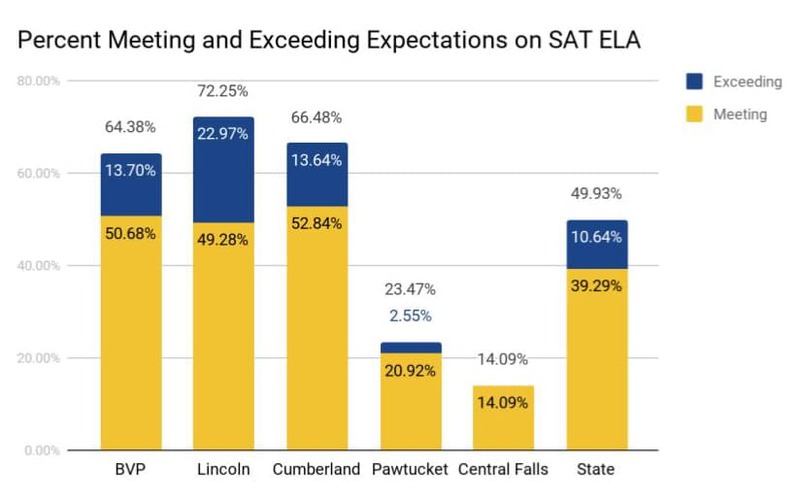 More so, BVP performed significantly better on both SAT ELA and math than schools with similar percentages of economically disadvantaged students. 2018 marked the first year of the new Rhode Island Comprehensive Assessment System (RICAS) in grade 3-8 in English Language Arts and mathematics. Overall, BVP outperformed the state of Rhode Island by 13 points in ELA and 15 points in math. 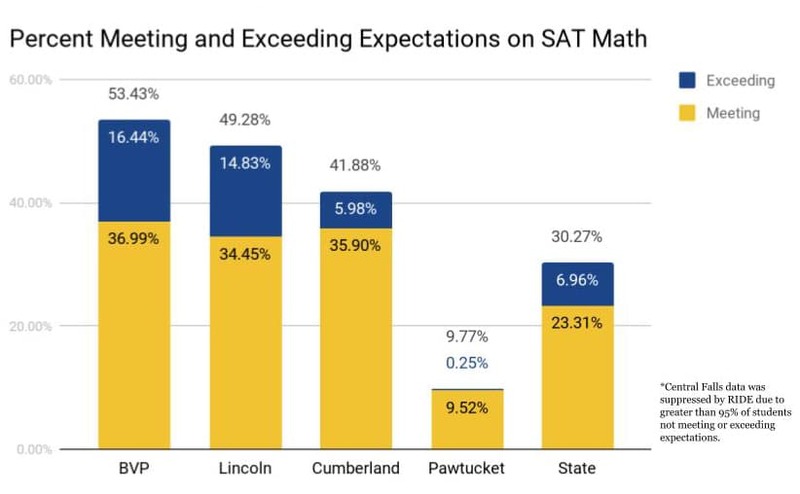 More specifically, BVP scholars were significantly more likely to meet or exceed expectations in both ELA and math than students across the state of Rhode Island in every grade. 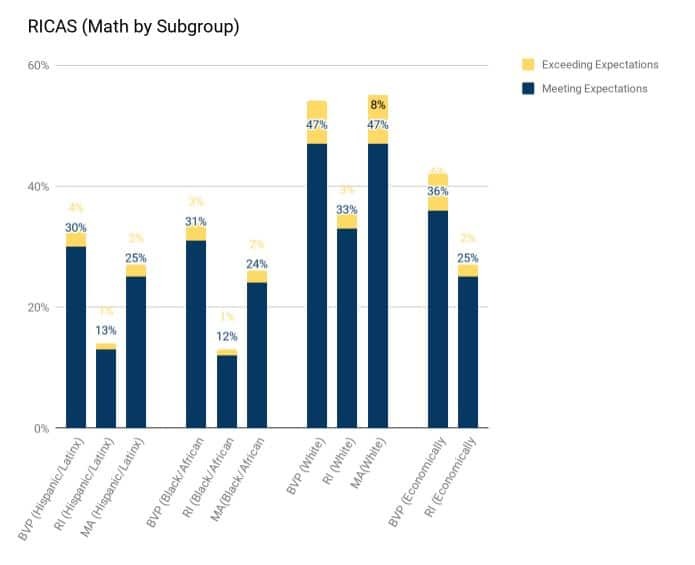 BVP scholars also outperformed their peers statewide in nearly every subgroup in both ELA and math (see graphs below). We are so proud of our Middle School 1 sixth grade scholars who had the highest math scores in the state! Detailed data is available on RIDE’s assessment page. We are pleased to report that BVP student achievement was some of the highest in the state. 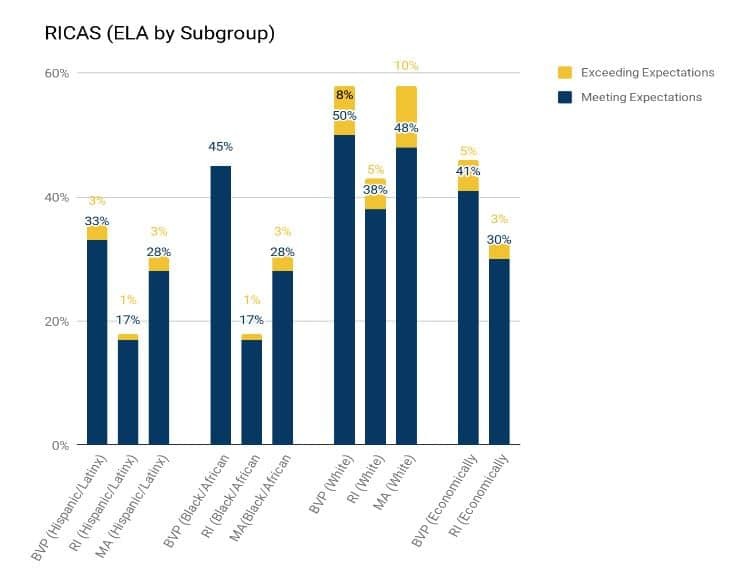 55% of BVP students scored proficient in ELA and 49.5% in math, compared to RI’s averages of 37.9% in ELA and 29.6% in math–that is a double digit difference in achievement in both. You can learn more about the state’s performance as a whole on the Rhode Island Department of Education’s Website. 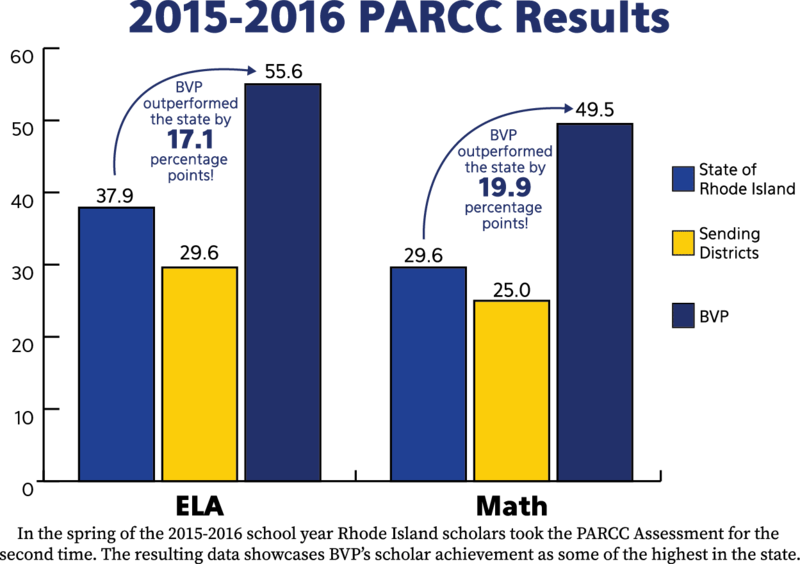 We are also pleased to report that we are proving what is possible for all students: There were only three schools which serve a majority of low-income students that exceeded the state averages in both English language arts (ELA) and math–BVP is one of them and all three are public charter schools.